Google Docs for Android got a major update that brings collaborative editing to Google Docs on Android including Rich text formatting as well. Google Docs recently got the offline capabilities for Android and now this major update giving users one more reason to use Google Docs for collaborative editing. Now with the latest users can see real time updates as others type on their PCs, tablets or smartphones. You can join for editing the document by tapping the document. 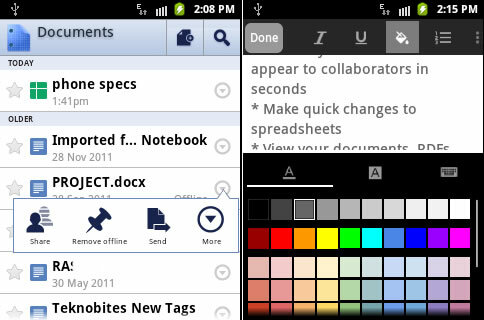 The Google Docs for Android interface is also been updated to make it easier for users to work on the go according to Google. Now it allows you to zoom specific paragraph with in the document by pinching to zoom. This update also brings rich text formatting that means you can italicize or bold those few lines for emphasis or add colors to make sentences stand out.